Alto Ignis Splash SX4 Swift Baleno MR. Genuine Suzuki 4-Pin Multi-Use Beige Relay. Made in Japan by Denso. Suzuki All Models (2000 - 2017). Genuine Suzuki Part. Colour: Beige. YOU WILL RECEIVE EXACT WHAT YOU SEE IN THE PICTURES. 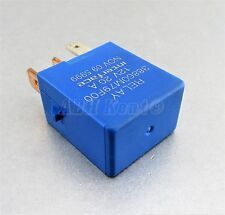 Genuine 4 Pin Blue Relay /Fuel Pump Relay. Genuine Suzuki & Nissan (2000-2017) 4-Pin Blue Relay. Made by Interface. Nissan Pixo ETC. Genuine Suzuki Part. Suzuki All Models (2000 - 2016). Pictures taken from actual item. Suzuki (1998 - 2007) 4-Blade Glow Plugs Relay WLO118650 NGK NO G73SV MR82B-621. Other Part Number:G73SV. Genuine4-Blade Black Relay /Glow Plugs Relay Relay. Madeby Suzuki. Condition:Used and Good Working Order. This relay is different to a normal Flasher relay as the earth pin is on the right when looking at pins. Not suitable for vehicles that have the flasher relay replaced with a towing version. 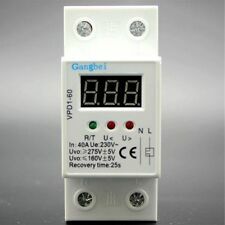 This relay does both Indicators and Hazard, relay will fast flash indicators of one or more of the indicators is faulty. On the Suzuki Baleno this is used as a lighting relay amongst others. 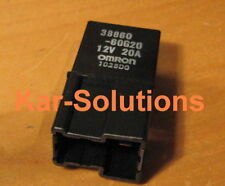 Omron 12V 20A Automotive Micro Relay - 4 Pin. Omron Part Number 38860-60G20 - 3886060G20 - 1028D0. 09207991 Hazard / Flasher Relay 38610-83E0. 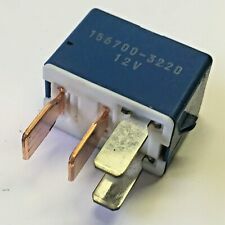 Genuine Suzuki (08-17) Multi-Purpose 4-Pin Blue Relay. 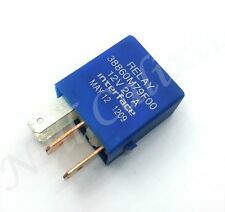 Genuine Suzuki 4-PIN Blue Multi-Use Relay. Made by Denso in Japan. Suzuki All Models (2008 - 2017). Genuine Suzuki Part. Suzuki Part Number:156700-3220. FLASHER UNIT RELAY 3 pin Square 12Volt Electronic Type 21w x 4 (2x5w) 21w x 2 (5w) Max 98w Branded Cross Reference Guide Manufacturer Product Code CI XFL104 Daihatsu 81980-87705-000 DL Products L638 Durite 0 744 13 Fister HW 558 Guardian GFL9 Hella 4DB 003 750 018 Hella 4DB 003 750 081 Hella 4DB 003 750 171 Hella 4DB 003 750 191 Hella 4DB 003 750 201 Hyundai 95550 36000 Intermotor 58972 Lighten Point FL9 Lucas SFB161 Mafco 425-2090 Nissan 25731 89960 Pearl PFR13 Quinton Hazell XFL104 S.M.P. Europe 58972 Subaru 786111170 Subaru 86111AA160 Tomic FL9 Unipart GFU 2213 Valeo M11 Wipac WFL 9 . Vauxhall Agila (2002 - 2012). Genuine 6 Pin Blue Relay/ Rear Fog light Relay. Suzuki Wagon R (2000 - 2008). Good Working Order. Condition:Used and Good Working Order. Relay module 38860-86G0 in good condition. Made by Deco in Korea. Genuine4 PIN Grey Multi-Use Relay. Chevrolet Almost All Models (1995-2005). Suzuki Almost All Models (1995-2005). Good Working Order. Condition: Used and Good Working Order. 2006 SUZUKI SX4 1.6. WE WILL DO OUR BEST TO RESOLVE THE ISSUE. More parts available. IF YOU ARE NOT SATISFIED FOR ANY REASON. Suzuki (2005-2016) 4-Pin Fuel Pump Blue Relay 38860M79F00 Interface NOV 09 5999. Nissan Pixo. Genuine 4 Pin Blue Relay /Fuel Pump Relay. Suzuki All Models (2005 - 2016). Genuine Suzuki Part. Condition: Used and Good Working Order. Suzuki wagon R (2000-2003) Foglight relay. 5 door Hatchback 1.3i petrol (Engine code G13BB) 5 speed manual gearbox. This vehicle part was removed from a year 2002 Suzuki wagon R . Removed from a right hand drive car. Suzuki Wagon R Sensor Relay. This vehicle part was removed from a year 2001 Suzuki wagon r . Removed from a right hand drive car. This is a used part and may have marks and signs of usage. Genuine Suzuki 4 PIN Blue Multi-Use Relay. Made by Denso in Japan. Suzuki Most Models (2008-2017). Suzuki Part Number:156700-3220. Genuine Suzuki Part. Good Working Order. Condition:Used and Good Working Order. Suzuki Swift Alto Liana Ignis Vitara Vauxhall Agila MULTI-PURPOSE DENSO RELAY. Condition is shown on the high quality photos .All used parts has been tested and is functional can have marks wear and tear.I recommend installation in specialist garage.I not take responsibility for any damage in installation.Returns is not accepted buyer take responsibility for compare parts number.If you have any questions please feel free to contact. Buying this item you accepted this terms and condition. XFL104 Flasher Unit. Automotive Surplus UK LTD.
Other Part Number:NOV 09 5999. Genuine4 Pin Blue Relay /Fuel Pump Relay. Suzuki All Models (2000 - 2016). Photos are for actual item. Good Working Order. GenuineSuzuki Part. Suzuki & Subaru (1998-2014) M ulti-Use 4-Pin Relay ACV31212-M04 60517-1716 NAiS 1M. Genuine 4 Pin Grey Relay/Multi-Use Relay. Subaru All Models (1998 - 2014). Suzuki All Models (1998 - 2014). Good Working Order. Genuine Suzuki 4 PIN Cream Multi-Use Relay. Made by Denso in Japan. Suzuki (Almost all Models from 2001 - Onward). Suzuki Part Number:156700-2480. Good Working Order. Condition: Used and Good Working Order. Landrover (196). DRL LED lights (3152). Complete DRL & Halo style Projector headlights. 509t & T5 LED dash bulbs (48). Yellow = Trigger wire. Connect to power wire of the sidelight /parking lights or headlights to dim the DRLs. VOLVO 30713512. MAZDA ZL0113215. MAZDA ZLY113215. SUZUKI 13800-63J00. SUZUKI 13800-84E00. TOYOTA 22204-0D020. 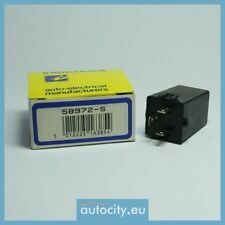 Suzuki & Subaru (1998-2014) M ulti-Use 4-Pin Relay ACV31212-M04 60517-1716 NAiS 1M. 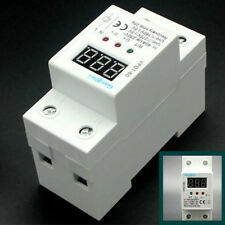 Genuine 4 Pin Grey Relay/Multi-Use Relay. Subaru All Models (1998 - 2014). Suzuki All Models (1998 - 2014). Photos are for actual item. Suzuki Alto Ignis Splash SX4 Swift Baleno MR 4-Pin Beige Relay Denso 156700-2480 12V Japan. Alto Ignis Splash SX4 Swift Baleno MR. Made inJapan by Denso. Genuine 4 Pin Beige Relay/Multi-Use. Suzuki All Models (2000 - 2016). Vauxhall Agila (2000 - 2008). 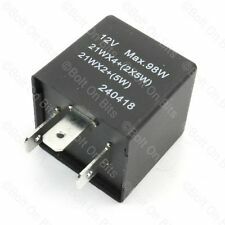 Genuine 3 Pin Black Relay/ Turn Signal Flasher Relay. Ref: 621 or 654. Suzuki Wagon R (2000 - 2008). Vauxhall Part Number:09207991. GenuineSuzuki Part. Suzuki Alto Relay . This vehicle part was removed from a year 2003 Suzuki Alto GL . Removed from a right hand drive car. This is a used part and may have marks and signs of usage. Daewoo Alomost All Models From (1990-2010). 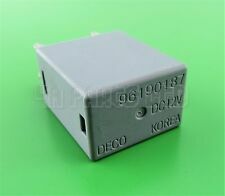 Genuine 4 Pin Grey Relay/Multi-Purpose Relay. Made inDeco in Korea. Suzuki Alomost All Models From (1990-2010). GenuineDaewoo / Suzuki Part. Collection also available in the Hull area. Item is used taken from a used car. Item may have general marks/scratches etc on it, but item is in a good useable condition. IF YOU NOT SURE DON'T BUY IT! WE ARE NOT LENDING THE PARTS! Hi, here we have for sale. ABOUT COLLECTION FROM US . Suzuki Alto 38700 relay. Removed from our 1.1GL, 5 door, 2004, on 66,800 miles which we are breaking - most parts currently available. SUZUKI SWIFT / CULTUS HATCHBACK 1997- 2003 RELAY (Removed from a right hand drive car). THIS VEHICLE PART WAS REMOVED FROM A YEAR 1999 SUZUKI SWIFT GLS 3 DOOR HATCHBACK 1.0i PETROL ( Engine Code G10A) 5 SPEED MANUAL. 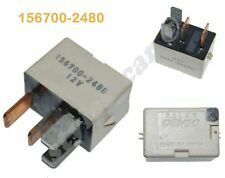 Suzuki & Subaru Multi Use Main Fan HID 5-Pin Brown Relay Denso 156700-1700 12V Japan. Subaru All Models (2000 - 2012). Made inJapan by Denso. Suzuki All Models (2000 - 2012). Genuine 5 Pin Brown Relay/Multi-Use. Suzuki wagon R (2000-2003) Cam sensor relay. 5 door Hatchback 1.3i petrol (Engine code G13BB) 5 speed manual gearbox. This vehicle part was removed from a year 2002 Suzuki wagon R . Removed from a right hand drive car. FOR SUZUKI VITARA. Vehicle compatibility. Part specifications. Quantity Included:1. Mounting Type:Bracket. Width:50 mm. SUZUKI LIANA GLX ( PRE-FACELIFT 2001-2004 )RELAY (Removed from a right hand drive car). THIS RELAY IS FROM A YEAR 2002 SUZUKI LIANA GLX ESTATE / HATCHBACK (02. REG) 1.6i 16v ( Engine Code M16A) FWD MANUAL. SUZUKI WAGON R 2000- 2003 RELAY (Removed from a right hand drive car). THIS VEHICLE PART WAS REMOVED FROM A YEAR 2003 SUZUKI WAGON R 5 DOOR SUV 1.3i PETROL ( Engine Code G13B) 5 SPEED MANUAL. THIS VEHICLE PART WAS REMOVED FROM A YEAR 2003 SUZUKI WAGON R 5 DOOR MPV 1.3 PETROL ( Engine Code G13B) 5 SPEED MANUAL. SUZUKI WAGON R GL 2000- 31/8/2003 RELAY (Removed from a right hand drive car). Suzuki wagon R (2000-2003) Map sensor relay. 5 door Hatchback 1.3i petrol (Engine code G13BB) 5 speed manual gearbox. This vehicle part was removed from a year 2002 Suzuki wagon R . Removed from a right hand drive car. Help us keep your car going for longer! removed from 2001 2.0 TD DIESEL SUZUKI GRAND VITARA MK1 May Have Minor Visible Usage Marks On It And May Need Cleaning.